The asphalt content in today’s shingles has fallen to an all-time low–and it’s a simple equation – lower asphalt content equals lower quality. As a matter of fact, the quality has gotten so bad that new shingles begin curling, cupping and shedding granules in just one year–and the asphalt shingle industry is in a panic trying to figure out how to keep fooling you. That is why Frank Farmer, owner of American Metal Roofs, vows to never install another asphalt roof. Investment grade metal roofing, on the other hand, is impervious to the elements that often destroy asphalt roofing materials. So not only will you enjoy the increased durability of metal, but you’ll gain the benefit of its eye catching beauty too. curl, crack, and streak due to algae and loss of granules. Composition shingles also act as a sponge, soaking up the sun’s radiant heat and trapping it inside the home’s attic space. Unlike metal, asphalt and fiberglass shingles hold onto their heat, forcing the home’s air-conditioning unit to work harder to keep the house cool. According to the asphalt roofing industry, the average shingle roof lasts 17 – 19 years. The actual lifetime is dramatically lower than this in hot climates and extreme weather situations. Unfortunately, the warranties on these products do not cover natural wear and tear from weather. Damage resulting from high winds, hail, rain, and extreme temperatures are also not covered. 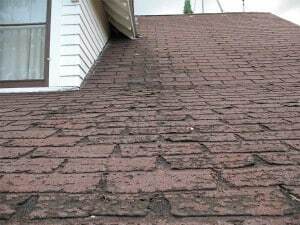 Lastly, in order for new shingle warranties to be effective, the old shingles must first be removed. These petroleum-soaked shingles are placed in landfills across the country where the oils and chemicals seep into the ground. There is unfortunately nothing “green” about a shingle roof. If a homeowner decides not to tear off the old shingles, the new shingle warranties are often voided. American Metal Roofs is changing the way America roofs, one metal roof at a time. So while we obviously stand behind our metal roofing systems vs. asphalt, read what other experts have to say as well about why asphalt fails. Failed shingles that we have tested contain approximately 30% asphalt by weight. New shingles contain less than 25%. This asphalt is mixed with sand and fine mineral matter and then has granules embedded in it. There is no separate asphalt binder for the filler. What coating exists on the back of the shingle appears to have bled through the mat from the top side during manufacturing. No wonder shingles ``weep`` water after only a few years. Just like asphalt shingles many of the other popular roofing materials today are chosen because of their price, not their longevity. These roofing alternatives, while initially attractive, quickly lose their appeal as they begin to deteriorate. Temporary roofs are initially less expensive than permanent roofing systems like metal. But when you consider the cost of periodic re-roofing, loss of energy efficiency, and potential damage due to weather, the cost of temporary roofing becomes astronomical over the long haul. That is why many people are avoiding temporary roofing materials. For hundreds of years, wood shakes and shingles adorned the roofs of homes in America. Because the wood was plentiful and the alternatives were few, wood shakes and shingles became an accepted part of the American landscape. Unfortunately, wood shakes, while beautiful in appearance, require regular and intense maintenance. Because the wood is an organic material, in hot and humid as well as shaded areas, it is susceptible to mold, algae, and other forms of unsightly growth. Since these growths are water retaining life forms, the shingles begin to rot, causing leaks to the underside of the roof. Eventually, the battens and decking begin to rot away and the whole roof needs to be torn off and replaced. Tearing off the old roof will have detrimental effects on the homeowner’s property. Pieces of wood, nails, and other debris litter the yard and neighborhood and, just like with standard shingles, the refuse must be deposited in a landfill. The beauty of clay tiles and slate are associated with certain areas of the country and are thought to be long lasting and highly efficient. However, the high weight of these products can cause undue strain on the structure of a home. Many clay and concrete tiles are highly pourous and, as water seeps into the tiles, the tiles crack and break. This situation is made worse by freeze-thaw weather cycles. In high winds, clay tiles can be quite dangerous and the damage leaves holes that could affect the interior of a home. These heavy products are also very prone to cause structural collapse in the event of seismic activity or an interior fire. Natural slate is less indestructible than man-made tiles but, unfortunately, the nails that hold them in place are not. In many instances, the nails rust away leaving the heavy slates held in place by gravity’s pull alone. Falling slate can be very dangerous and damaging to property. There are many other roofing materials such as rubber and other composite materials. These materials are higher cost materials and are liable to fade and chalk in the intense heat of the sun. Many of these products also do not yet have proven track records.